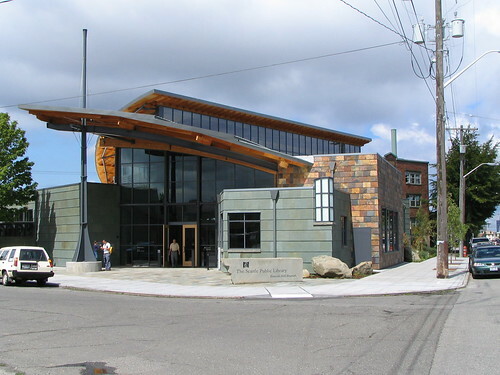 This is how the Beacon Hill Library looked almost nine years ago, shortly after opening. Photo by Wendi Dunlap. Skin Deep Dance Studio in North Beacon Hill is looking for someone to work the front desk on Tuesday, Wednesday, and Thursday evenings from 5-8 p.m. Duties include cleaning, signing people into computer and selling merchandise in the boutique, as well as some data entry and social networking on Facebook. Pay is $10 per hour. For information, call 206-322-9500. First I want to wish the entire Community a Happy Holiday Season. My return to the area as the Head Volleyball Coach at Franklin HS has been wonderful!! We are looking for a Coach to work with our JV and C team programs. My first choice is to fill the position from within the community. We are looking for candidates with some background in the game, and a positive experience teaching or coaching 15 and 16 year old young women. New coaches will attend the Gold Medal Squared coaching clinic in May. This is the premier coaching training program in the country, and covers the methods we use to teach fundamental skills. So a little dust on the scrapbook is ok! I know it sounds early, but the School District process can be lengthy and I hope to have the staff in place for the Summer program. If you, or anyone you know might be interested, contact me at jphardy@email.com or through the team’s Facebook page. Property owners on some parts of Beacon Hill may be able to help improve broadband service for their neighbors by providing space for broadband equipment on their property. The group Upping Technology for Underserved Neighbors (UPTUN) reports that CenturyLink is seeking neighbors in certain locations who would be willing to allow the company to place a broadband cabinet on their property, or in the public right-of-way next to their property. Each project on Beacon Hill would serve from 175-877 residence and business addresses in the area. To qualify, you must be within 500 feet of the requested address (see the map below) if the neighborhood is served by overhead wiring, or 250 feet if the service is underground. If you think you can help, contact Jeff Lawrey at CenturyLink at 206-345-0333 or r.lawrey@centurylink.com to discuss the projects, including equipment, landscaping options, and any other questions. 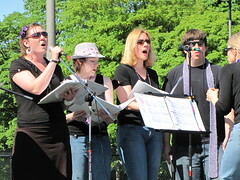 A La Carte performing at last summer's Beacon Hill Festival at Jefferson Park. Photo by Wendi. Three local organizations are seeking new members. Perhaps you are someone they are looking for. ROCKiT Space, the music and art organization that puts together events such as Beacon Rocks!, Tuesday Folk Club, Songwriters’ Circle, and more, is seeking board members. If you are interested in being part of ROCKiT Space’s future, contact them for further information. Two Beacon Hill a cappella vocal groups are also seeking new members. A La Carte is looking for any and all vocal ranges, from both men and women. To audition, please prepare a two-minute vocal piece to be performed a cappella, and contact ALaCrteACappella@gmail.com. The Beaconettes performed at the opening of Lander (now Roberto Maestas) Festival Street in December 2009. Photo by Jason Simpson. The Beaconettes won the “People’s Choice” and “Most Creative” awards at last year’s Figgy Pudding Caroling contest with their satirical and left-leaning tunes. Now, they are seeking an alto to join the group, as well as prepping for this year’s contest on December 2. Please contact the same address as above: ALaCrteACappella@gmail.com. If you don’t want to sing, you can also help by contributing to the Beaconettes’ Figgy Pudding fundraising drive here. The Beacon Hill Merchants Association is a newly created organization of storefront and home-based businesses on Beacon Hill in Seattle. We are seeking a part-time Business District Coordinator to assist in creating relationships with property and business owners, building a diverse membership and beginning implementation of a comprehensive business district strategy for Beacon Hill. The other day, we mentioned Happenin’ on the Hill, a celebration at the Maple School Natural Area this Saturday. The event hosts are seeking a “talented busker” who will play at the event to keep it festive. They say they have some money left in the budget to pay, so if you’re a local musician who can “play the stuff that you love” with an acoustic setup, you might want to contact them. See their Craigslist ad for info. Continuing to dig into the issue of (the lack of decent) broadband in the Central District and Beacon Hill, Glenn Fleishman at Publicola sits down with former King County Executive candidate and new Broadstripe Pacific Northwest General Manager David Irons. Of the 23 nodes in Seattle, “We have made significant electronic improvement to resolve the issues in 18 of them,” with the rest proving more problematic and requiring new cable runs or other changes. Irons said the remaining five nodes will be improved between February and March 2010. Customer service hours have been extended from 7 pm Pacific on weekdays to 9 pm Pacific, and in January that will go to 10 pm Pacific. Weekend customer support has been replaced with full-on tech support, with staff that can handle both billing and technical questions. Engineers are now on call for major problems 24 hours a day, as well. These sound like good changes, and I do have to say that our internet connection at home has been better than it was in September, but it’s still nothing to be bragging about. Irons also states that Broadstripe has 8 open positions they’re looking to fill. Broadstripe is expected to emerge from Chapter 11 bankruptcy in the first quarter of 2010. There’s lots more interesting information in the full article at Publicola.